Erfinder (1847-1922)]. - Brockett, Paul, Bibliothekar und Bibliograph (1872-1946). TLS with 3 autogr. lines. Washington, DC. 1 S. auf Doppelblatt. 8vo. Dabei: 7 Photostatkopien, davon 6 negativ (4to) und eine positiv (Folio). Zahlreiche Beilagen. Fine collection of material about Alexander Graham Bell's experimental designs for hydrofoils and flying machines in his last years, i. e. the time of World War I and immediately thereafter. 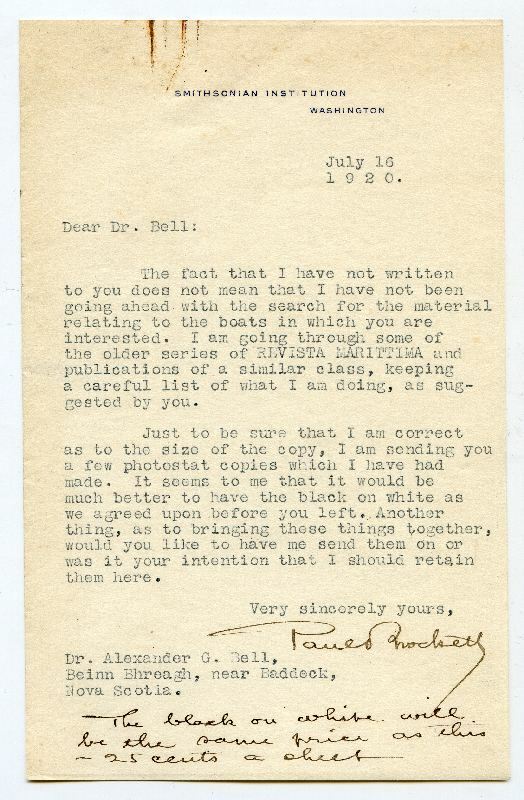 Brockett wrote to Bell: "The fact that I have not written to you does not mean that I have not been going ahead with the search for the material relating to the boats in which you are interested. I am going through some of the older series of 'Revista Marittima' and publications of a similar class, keeping a careful list of what I am doing, as suggested by you. Just to be sure that I am correct as to the size of the copy, I am sending you a few photostat copies which I have had made. It seems to me that it would have been much better to have the black on white as we agreed upon before you left. Another thing, as to bringing these things together, would you like to have me send them on or was it your intention that I should retain them here [...]". - A. G. Bell did not only invent the first telephone but was also a pioneer in the construction of hydrofoil boats. He undertook his first experiments in 1908 with his collaborator Fredrick "Casey" Baldwin (1882-1948), and in 1915 they created their most successful model, the HD-4, which reached 114 kilometers per hour - a record unchallenged for a decade..
eminent scientist, inventor, engineer and innovator (1847-1922). Typed letter signed. Beinn Bhreagh, Victoria County, Cape Breton, Nova Scotia. 4to. ¾ p. Addendum. 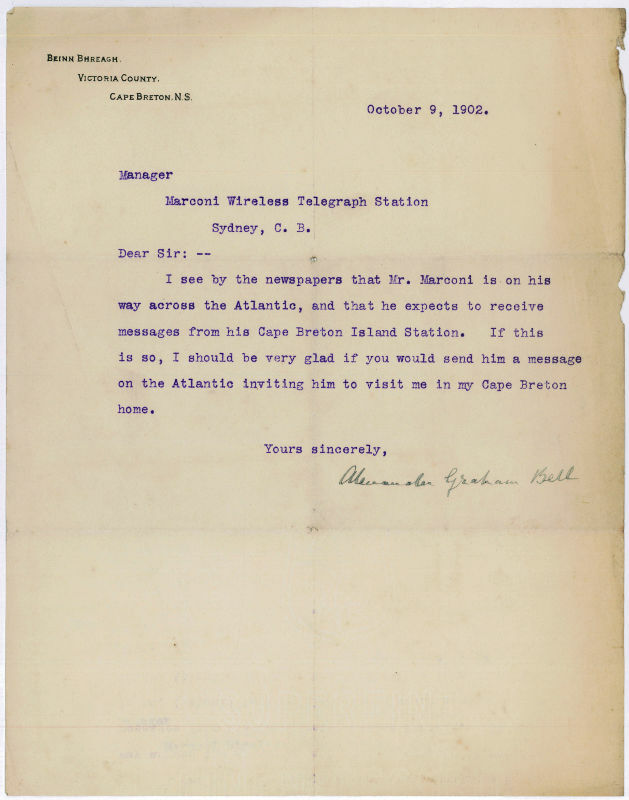 The inventor of the telephone sends a telegraph message to Marconi in the mid-Atlantic, less than a year after Marconi himself had sent the first trans-Atlantic message from England to Canada (12 December 1901) and two months before the first such signal was to be sent from Canada to England (5 December 1902). 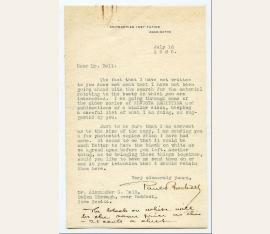 To the "Manager | Marconi Wireless Telegraph Station | Sydney, C. B. ", i. e. R. Norman Vyvyan: "I see by the newspapers that Mr Marconi is on his way across the Atlantic, and that he expects to receive messages from his Cape Breton Island Station. If this is so, I should be very glad if you would send him a message on the Atlantic inviting him to visit me in my Cape Breton home [...]". - Accompanied by a page from Leslie's Weekly for 2 September 1902 containing an account by Everett Wilkes of visits to both Vyvyan and Bell. Of his visit to Glace Bay he writes: "Mr Marconi was absent at the time of my visit, but his personal friend and chief of staff, Mr Vyvoyan [sic], to whom I presented my letters of introduction, received me cordially and talked freely on the great subject which he and his employer have nearest at heart. I was allowed to take pictures of the exterior of the station, but not of the interior of the receiving room, the most important part of the plant. During Mr Marconi's absence nobody is permitted to enter this apartment except Mr Vyvoyan [...] Mr Vyvoyan stated that the delay in commencing commercial operations was due to Mr Marconi's anxiety to have his system thoroughly tested before offering it to the public'. Our reporter then made a call on Professor Graham Bell 'which required a not very long journey to Glace Bay [...] There, for the last five years, during the summer months, he has been experimenting, and the goal to which he is looking forward is the construction of a dirigible flying-machine [...] It is perhaps an unfortunate thing for science that Professor Bell is now a wealthy man; otherwise he might work a little harder' [...]". - On headed paper, light dust-staining and creasing at right-hand side..
Erfinder (1847-1922). Autograph drawing, signed with initials ("H. A. L."). [Beinn Bhreagh, Nova Scotia]. Tintenzeichnung. 1 S. Beidseitig laminiert. 8vo. This humorous cartoon shows "Ye great new invention of F. W. B. "; underneath it, Bell writes "To be continued". The initials stand for Bell's pseudonym "H. A. Largelamb" (anagram for "A. Graham Bell"), under which he used to write for the "National Geographic". - A. G. Bell did not only invent the first telephone but was also a pioneer in the construction of hydrofoil boats. In 1908, he and his collaborator Fredrick "Casey" Baldwin (1882-1948) undertook such experiments first, and in 1915 both created their most successful model, the HD-4, that reached the speed of 114 kilometer per hour and should remain for a long time their most successful model. 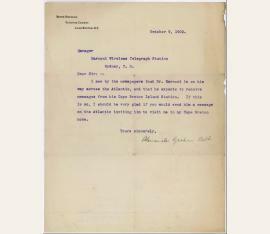 - Signed on the reverse by Baldwin ("Property of F. W. Baldwin")..
Alexander Graham Bell (1847–1922), American engineer and inventor. Autograph letter signed. Salem (Massachusetts), February 2, 1874. Large 8°. 1½ pp. and address on double leaf. 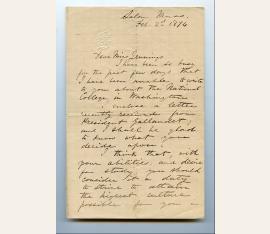 – A letter to Miss Alice C. Jennings (1840–1923), a Massachusetts teacher known for her work with deaf children and her contribution to the study of speech-reading: „I have been so busy for the past few days that I have been unable to write to you about the National College in Washington. I enclose a letter recently received from President Gallaudet; and I shall be glad to know what you decide upon. I think that, with your abilities, and desire for study, you should consider it a duty to strive to attain the highest culture possible for you in this country [...]“. – Edward Miner Gallaudet (1837–1917), son of the minister and pioneer of deaf education Thomas Hopkins Gallaudet, founded together with the philanthropist and former U.S. Postmaster, Amos Kendall the National Deaf-Mute College in Washington, DC, the first college for deaf students (1894 renamed after his father to Gallaudet College). – On stationery with embossed initial („B“); central horizontal and vertical fold, and some bits of old reparative tape along folds on the reverse.